The Suez Crisis was a mostly failed invasion of Egypt in late 1956 by Israel followed by the United Kingdom and France. The aims were to regain Western control of the Suez Canal and remove Egyptian President Gamal Abdel Nasser from power. The Middle East, directly south of the Soviet Union, was an area of extreme importance and also great instability during the Cold War. The Suez Crisis was an invasion of Egypt in late 1956 by Israel followed by the United Kingdom and France. The aims were to regain Western control of the Suez Canal and remove Egyptian President Gamal Abdel Nasser from power. The invasion was poorly planned and Eisenhower persuaded the United Kingdom and France to retreat, which was an international embarrassment for the latter countries and emboldened the USSR and Egypt. As a result of the conflict, the United Nations created the UNEF Peacekeepers to police the Egyptian–Israeli border, and British Prime Minister Anthony Eden resigned. The Suez stalemate was a turning point heralding an ever-growing rift between the Atlantic Cold War allies, who were becoming far less of a united monolith than in the immediate aftermath of the Second World War. Suez Canal: An artificial sea-level waterway in Egypt connecting the Mediterranean Sea to the Red Sea through the Isthmus of Suez, which offers watercraft a shorter journey between the North Atlantic and northern Indian oceans via the Mediterranean and Red seas by avoiding the South Atlantic and southern Indian oceans, reducing the journey by approximately 4,300 miles. Gamal Abdel Nasser: The second President of Egypt, serving from 1956 until his death, who led the 1952 overthrow of the monarchy and introduced far-reaching land reforms the following year. The Suez Crisis, also named the Tripartite Aggression and the Kadesh Operation, was an invasion of Egypt in late 1956 by Israel, followed by the United Kingdom and France. The aims were to regain Western control of the Suez Canal and remove Egyptian President Gamal Abdel Nasser from power. After the fighting started, the United States, the Soviet Union, and the United Nations forced the three invaders to withdraw. The episode humiliated Great Britain and France and strengthened Nasser. On October 29, Israel invaded the Egyptian Sinai. Britain and France issued a joint ultimatum to cease fire, which was ignored. On November 5, Britain and France landed paratroopers along the Suez Canal. The Egyptian forces were defeated, but did block the canal to all shipping. It became clear that the Israeli invasion and the subsequent Anglo-French attack were planned beforehand by the three countries. The three allies attained a number of their military objectives, but the Canal was now useless and heavy pressure from the United States and the USSR forced them to withdraw. U.S. President Dwight D. Eisenhower had strongly warned Britain not to invade; he now threatened serious damage to the British financial system. Historians conclude the crisis “signified the end of Great Britain’s role as one of the world’s major powers.” Peden in 2012 stated, “The Suez Crisis is widely believed to have contributed significantly to Britain’s decline as a world power.” The Suez Canal was closed from October 1956 until March 1957. Israel fulfilled some of its objectives, such as attaining freedom of navigation through the Straits of Tiran. As a result of the conflict, the United Nations created the UNEF Peacekeepers to police the Egyptian-Israeli border, British Prime Minister Anthony Eden resigned, Canadian Minister of External Affairs Lester Pearson won the Nobel Peace Prize, and the USSR may have been emboldened to invade Hungary. Nationalization of the Suez Canal: Statue of Ferdinand de Lesseps (a Frenchman who built the Suez Canal) was removed following the nationalization of the Suez Canal in 1956. The Middle East during the Cold War was of extreme importance and also great instability. The region lay directly south of the Soviet Union, which traditionally had great influence in Turkey and Iran. The area also had vast reserves of oil, not crucial for either superpower in the 1950s (which each held large oil reserves on its own), but essential for the rapidly rebuilding American allies Europe and Japan. The original American plan for the Middle East was to form a defensive perimeter along the north of the region. Thus Turkey, Iraq, Iran, and Pakistan signed the Baghdad Pact and joined CENTO. The Eastern response was to seek influence in states such as Syria and Egypt. Czechoslovakia and Bulgaria made arms deals to Egypt and Syria, giving Warsaw Pact members a strong presence in the region. Egypt, a former British protectorate, was one of the region’s most important prizes with its large population and political power throughout the region. British forces were thrown out by General Gamal Abdel Nasser in 1956, when he nationalized the Suez Canal. Syria was a former French protectorate. Eisenhower persuaded the United Kingdom and France to retreat from a badly planned invasion with Israel launched to regain control of the canal from Egypt. While the Americans were forced to operate covertly so as not to embarrass their allies, the Eastern Bloc nations made loud threats against the “imperialists” and worked to portray themselves as the defenders of the Third World. Nasser was later lauded around the globe, especially in the Arab world. While both superpowers courted Nasser, the Americans balked at funding the massive Aswan High Dam project. The Warsaw Pact countries happily agreed, however, and signed a treaty of friendship and cooperation with the Egyptians and the Syrians. Thus the Suez stalemate was a turning point heralding an ever-growing rift between the Atlantic Cold War allies, which were becoming far less of a united monolith than they were in the immediate aftermath of the Second World War. Italy, France, Spain, West Germany, Norway, Canada, and Britain also developed their own nuclear forces as well as a Common Market to be less dependent on the United States. Such rifts mirror changes in global economics. American economic competitiveness faltered in the face of the challenges of Japan and West Germany, which recovered rapidly from the wartime decimation of their respective industrial bases. The 20th-century successor to the UK as the “workshop of the world,” the United States found its competitive edge dulled in the international markets while it faced intensified foreign competition at home. Meanwhile, the Warsaw Pact countries were closely allied both militarily and economically. All Warsaw Pact nations had nuclear weapons and supplied other countries with weapons, supplies, and economic aid. The Hungarian Revolution of 1956 occurred shortly after Khrushchev arranged the removal of Hungary’s Stalinist leader Mátyás Rákosi, but the new regime was soon crushed by the Soviet army. The Hungarian Revolution of 1956 occurred shortly after Khrushchev arranged the removal of Hungary’s Stalinist leader Mátyás Rákosi. In response to a popular uprising, the new regime formally disbanded the secret police, declared its intention to withdraw from the Warsaw Pact, and pledged to re-establish free elections. In response, the Soviet army invaded and crushed the revolution. Thousands of Hungarians were arrested, imprisoned, and deported to the Soviet Union, and approximately 200,000 Hungarians fled Hungary in the chaos. Hungarian leader Imre Nagy and others were executed following secret trials. Titoists: People who follow the policies and practices associated with Josip Broz Tito during the Cold War, characterized by an opposition to the Soviet Union. Mátyás Rákosi: A Jewish Hungarian communist politician, the leader of Hungary’s Communist Party from 1945 to 1956, and the de facto ruler of Communist Hungary from 1949 to 1956. An ardent Stalinist, his government was a satellite of the Soviet Union. The Hungarian Revolution of 1956 or the Hungarian Uprising of 1956 was a nationwide revolt against the government of the Hungarian People’s Republic and its Soviet-imposed policies, lasting from October 23 until November 10, 1956. Though initially leaderless, it was the first major threat to Soviet control since the USSR’s forces drove out Nazi Germany from its territory at the end of World War II and broke into Central and Eastern Europe. The revolt began as a student demonstration, which attracted thousands marching through central Budapest to the Parliament building, calling out on the streets using a van with loudspeakers via Radio Free Europe. A student delegation that entered the radio building to try to broadcast the students’ demands was detained. When the delegation’s release was demanded by the demonstrators outside, they were fired upon by the State Security Police (ÁVH) from within the building. One student died and was wrapped in a flag and held above the crowd. This was the start of the revolution. As the news spread, disorder and violence erupted throughout the capital. The revolt spread quickly across Hungary and the government collapsed. Thousands organized into militias, battling the ÁVH and Soviet troops. Pro-Soviet communists and ÁVH members were often executed or imprisoned and former political prisoners were released and armed. Radical impromptu workers’ councils wrested municipal control from the ruling Hungarian Working People’s Party and demanded political changes. A new government formally disbanded the ÁVH, declared its intention to withdraw from the Warsaw Pact, and pledged to re-establish free elections. By the end of October, fighting had almost stopped and a sense of normality began to return. After announcing a willingness to negotiate a withdrawal of Soviet forces, the Politburo changed its mind and moved to crush the revolution. On November 4, a large Soviet force invaded Budapest and other regions of the country. The Hungarian resistance continued until November 10. More than 2,500 Hungarians and 700 Soviet troops were killed in the conflict, and 200,000 Hungarians fled as refugees. Mass arrests and denunciations continued for months thereafter. By January 1957, the new Soviet-installed government had suppressed all public opposition. These Soviet actions, while strengthening control over the Eastern Bloc, alienated many Western Marxists, leading to splits and/or considerable losses of membership for Communist Parties in the West. Public discussion about this revolution was suppressed in Hungary for more than 30 years. Since the thaw of the 1980s, it has been a subject of intense study and debate. At the inauguration of the Third Hungarian Republic in 1989, October 23 was declared a national holiday. Hungarian Uprising: Flag of Hungary, with the communist coat of arms cut out. The flag with a hole became the symbol of the revolution. Hungary became a communist state under the severely authoritarian leadership of Mátyás Rákosi. Under Rákosi’s reign, the Security Police (ÁVH) began a series of purges, first within the Communist Party to end opposition to Rákosi’s reign. The victims were labeled as “Titoists,” “western agents,” or “Trotskyists” for as insignificant a crime as spending time in the West to participate in the Spanish Civil War. In total, about half of all the middle and lower level party officials—at least 7,000 people—were purged. From 1950 to 1952, the Security Police forcibly relocated thousands of people to obtain property and housing for the Working People’s Party members and to remove the threat of the intellectual and “bourgeois” class. Thousands were arrested, tortured, tried, and imprisoned in concentration camps, deported to the east, or executed, including ÁVH founder László Rajk. In a single year, more than 26,000 people were forcibly relocated from Budapest. As a consequence, jobs and housing were very difficult to obtain. The deportees generally experienced terrible living conditions and were interned as slave labor on collective farms. Many died as a result of poor living conditions and malnutrition. The Rákosi government thoroughly politicized Hungary’s educational system to supplant the educated classes with a “toiling intelligentsia.” Russian language study and Communist political instruction were made mandatory in schools and universities nationwide. Religious schools were nationalized and church leaders were replaced by those loyal to the government. In 1949 the leader of the Hungarian Catholic Church, Cardinal József Mindszenty, was arrested and sentenced to life imprisonment for treason. Under Rákosi, Hungary’s government was among the most repressive in Europe. After Stalinist dictator Mátyás Rákosi was replaced by Imre Nagy following Stalin’s death and Polish reformist Władysław Gomułka was able to enact some reformist requests, large numbers of protesting Hungarians compiled a list of Demands of Hungarian Revolutionaries of 1956, including free secret-ballot elections, independent tribunals, and inquiries into Stalin and Rákosi Hungarian activities. Under the orders of Soviet defense minister Georgy Zhukov, Soviet tanks entered Budapest. Protester attacks at the Parliament forced the collapse of the government. The new government that came to power during the revolution formally disbanded the Hungarian secret police, declared its intention to withdraw from the Warsaw Pact, and pledged to re-establish free elections. The Soviet Politburo thereafter moved to crush the revolution with a large Soviet force invading Budapest and other regions of the country. Approximately 200,000 Hungarians fled Hungary, some 26,000 Hungarians were put on trial by the new Soviet-installed János Kádár government and, of those, 13,000 were imprisoned. Imre Nagy was executed along with Pál Maléter and Miklós Gimes after secret trials in June 1958. By January 1957, the Hungarian government had suppressed all public opposition. These Hungarian government’s violent oppressive actions alienated many Western Marxists, yet strengthened communist control in all the European communist states, cultivating the perception that communism was both irreversible and monolithic. One of the most significant impacts of the U.S. policy of containment was the outbreak of the Korean War, when the U.S. came to aid of South Korea against the communist North Korea. Korea was divided at the end of World War II along the 38th parallel into Soviet and U.S. occupation zones, in which a communist government was installed in the North by the Soviets and an elected government in the South came to power after UN-supervised elections in 1948. In June 1950, Kim Il-sung’s North Korean People’s Army invaded South Korea. Fearing that communist Korea under a Kim Il Sung dictatorship could threaten Japan and foster other communist movements in Asia, Truman committed U.S. forces and obtained help from the United Nations to counter the North Korean invasion. After a Chinese invasion to assist the North Koreans, fighting stabilized along the 38th parallel, which separated the Koreas and devolved into a war of attrition. The Korean Armistice Agreement was signed in July 1953 after the death of Stalin, but no official peace treaty was ever signed and technically North and South Korea are still at war. proxy war: A conflict between two states or non-state actors in which neither entity directly engages the other. While this can encompass a breadth of armed confrontation, its core definition hinges on two separate powers utilizing external strife to somehow attack the interests or territorial holdings of the other. This frequently involves both countries fighting their opponent’s allies or assisting their allies in fighting their opponent. war of attrition: A military strategy in which a belligerent attempts to win a war by wearing down the enemy to the point of collapse through continuous losses in personnel and material. cult of personality: When an individual uses mass media, propaganda, or other methods to create an idealized, heroic, and at times worshipful image, often through unquestioning flattery and praise. In June 1950, Kim Il-sung’s North Korean People’s Army invaded South Korea. Joseph Stalin “planned, prepared, and initiated” the invasion, creating “detailed [war] plans” that were communicated to the North Koreans. To Stalin’s surprise, the UN Security Council backed the defense of South Korea. Fearing that communist Korea under a Kim Il Sung dictatorship could threaten Japan and foster other communist movements in Asia, Truman committed U.S. forces and obtained help from the United Nations to counter the North Korean invasion. The Soviets boycotted UN Security Council meetings while protesting the Council’s failure to seat the People’s Republic of China and thus did not veto the Council’s approval of UN action to oppose the North Korean invasion. A joint UN force of personnel from South Korea, the United States, Britain, Turkey, Canada, Australia, France, the Philippines, the Netherlands, Belgium, New Zealand, and other countries joined to stop the invasion. After the first two months of the conflict, South Korean forces were on the point of defeat, forced back to the Pusan Perimeter. In September 1950, an amphibious UN counter-offensive was launched at Inchon and cut off many of the North Korean troops. Those that escaped envelopment and capture were rapidly forced back north all the way to the border with China at the Yalu River or into the mountainous interior. At this point, in October 1950, Chinese forces crossed the Yalu and entered the war. Chinese intervention triggered a retreat of UN forces that continued until mid-1951. The fighting ended on July 27, 1953, when an armistice was signed. The agreement created the Korean Demilitarized Zone to separate North and South Korea and allowed the return of prisoners. In North Korea, Kim Il-sung created a highly centralized and brutal dictatorship, according himself unlimited power and generating a formidable cult of personality. However, no peace treaty has been signed, and the two Koreas are technically still at war. Periodic clashes, many of which are deadly, have continued to the present. The Korean War is seen as one of the most significant impacts of the containment policy of the U.S. government, aimed at preventing the spread of communism, and was one of the major proxy wars of the Cold War. Korea was ruled by Japan from 1910 until the closing days of World War II. In August 1945, the Soviet Union declared war on Japan as a result of an agreement with the United States and liberated Korea north of the 38th parallel. U.S. forces subsequently moved into the south. By 1948, as a product of the Cold War between the Soviet Union and the United States, Korea was split into two regions with separate governments. Both governments claimed to be the legitimate government of Korea and neither side accepted the border as permanent. The civil war escalated into open warfare when North Korean forces—supported by the Soviet Union and China—moved to the south to unite the country on June 25, 1950. In early 1950, the United States made its first commitment to form a peace treaty with Japan that would guarantee long-term U.S. military bases. Some observers (including George Kennan) believed that the Japanese treaty led Stalin to approve a plan to invade U.S.-supported South Korea on June 25, 1950. Among other effects, the Korean War galvanized NATO to develop a military structure. Public opinion in countries involved, such as Great Britain, was divided for and against the war. Many feared an escalation into a general war with Communist China and even nuclear war. The strong opposition to the war often strained Anglo-American relations. For these reasons, British officials sought a speedy end to the conflict, hoping to unite Korea under United Nations auspices and withdrawal of all foreign forces. The war was a political disaster for the Soviet Union. Its central objective, the unification of the Korean peninsula under the Kim Il-Sung regime, was not achieved. Boundaries of both parts of Korea remained practically unchanged. Relations with communist ally China were seriously and permanently spoiled, leading to the Sino-Soviet split that lasted until the collapse of the Soviet Union in 1991. The United States’ strong resistance to the invasion may have prevented a Soviet intervention in Yugoslavia during the Tito-Stalin split. The war, meanwhile, united the countries within the capitalist bloc: the Korean War accelerated the conclusion of a peace agreement between the U.S. and Japan, the warming of West Germany’s relations with other western countries, and creation of military and political blocs ANZUS (1951) and SEATO (1954). However, because of the war, the authority of the Soviets grew, evident in their readiness to interfere in developing countries of the Third World, many of which went down the socialist path of development after the Korean War after selecting the Soviet Union as their patron. 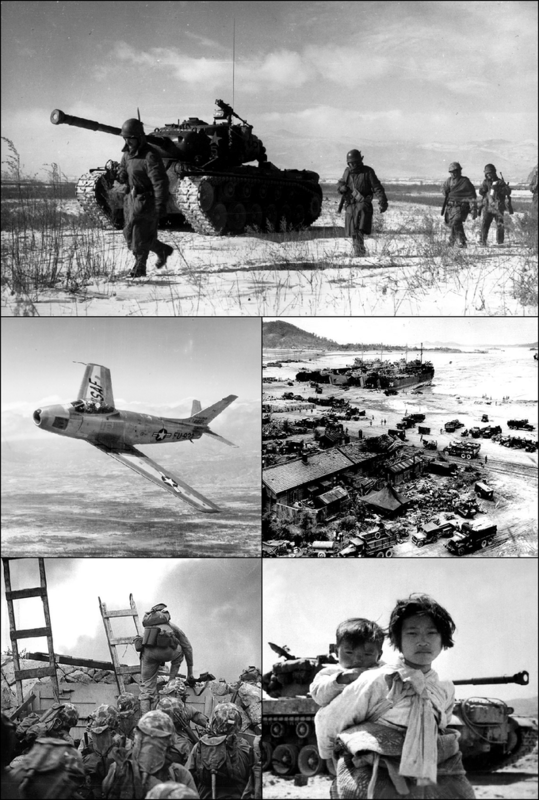 Korean War: Clockwise from top: U.S. Marines retreating during the Battle of the Chosin Resevoir, U.N. landing at Incheon, Korean refugees in front of an American M-26 tank, U.S. Marines, led by First Lieutenant Baldomero Lopez, landing at Incheon, and an American F-86 Sabre fighter jet. The Berlin Wall was a barrier that divided Germany from 1961 to 1989, aimed at preventing East Germans from fleeing to stop economically disastrous migration of workers. Berlin was divided between East and West since the end of World War II, with the Western powers occupying the Western portion and the Soviet Union occupying the East. After increasing tensions between the Soviets and the Western powers during the first 15 years of the Cold War, the Soviet Union decided to build a physical barrier between East and West Berlin, thereby creating a real counterpoint to the symbolic “Iron Curtain” that had divided East and West since 1945. The main purpose of the Wall was to prevent East Germans from fleeing, thus stopping an economically disastrous migration of workers. The Berlin Wall was officially referred to as the “Anti- Fascist Protective Wall” by East German authorities, implying that the NATO countries and West Germany in particular were considered “fascists” by East German propaganda. With the closing of the East-West sector boundary in Berlin, the vast majority of East Germans could no longer travel or emigrate to West Germany, and Berlin soon went from the easiest place to make an unauthorized crossing between East and West Germany to the most difficult. Many families were split, while East Berliners employed in the West were cut off from their jobs. Inner German border: The border between the German Democratic Republic (GDR, East Germany) and the Federal Republic of Germany (FRG, West Germany) from 1949 to 1990. Not including the similar but physically separate Berlin Wall, the border was 866 miles long and ran from the Baltic Sea to Czechoslovakia. German Democratic Republic: A state in the Eastern Bloc during the Cold War period. From 1949 to 1990, it administered the region of Germany occupied by Soviet forces at the end of World War II. Checkpoint Charlie: The name given by the Western Allies to the best-known Berlin Wall crossing point between East Berlin and West Berlin during the Cold War. The Berlin Wall was a barrier that divided Germany from 1961 to 1989. Constructed by the German Democratic Republic (GDR, East Germany) starting on August 13, 1961, the Wall completely cut off West Berlin from surrounding East Germany and from East Berlin until government officials opened it in November 1989. Its demolition officially began on June 13, 1990 and was completed in 1992. The barrier included guard towers placed along large concrete walls, which circumscribed a wide area (later known as the “death strip”) that contained anti-vehicle trenches, “fakir beds,” and other defenses. The Eastern Bloc claimed that the Wall was erected to protect its population from fascist elements conspiring to prevent the “will of the people” in building a socialist state in East Germany. In practice, the Wall prevented the massive emigration and defection that had marked East Germany and the communist Eastern Bloc during the post-World War II period. The Berlin Wall was officially referred to as the “Anti-Fascist Protective Wall” by GDR authorities, implying that the NATO countries and West Germany in particular were considered “fascists” by GDR propaganda. The West Berlin city government sometimes referred to it as the “Wall of Shame”—a term coined by mayor Willy Brandt—while condemning the Wall’s restriction on freedom of movement. Along with the separate and much longer Inner German border (IGB), which demarcated the border between East and West Germany, it came to symbolize a physical marker of the “Iron Curtain” that separated Western Europe and the Eastern Bloc during the Cold War. Before the Wall’s erection, 3.5 million East Germans circumvented Eastern Bloc emigration restrictions and defected from the GDR, many by crossing over the border from East Berlin into West Berlin. From there, they could travel to West Germany and other Western European countries. Between 1961 and 1989, the Wall prevented almost all such emigration. During this period, around 5,000 people attempted to escape over the Wall, with an estimated death toll ranging from 136 to more than 200 in and around Berlin. Berlin Wall: Photograph of the Berlin Wall taken from the West side. The Wall was built in 1961 to prevent East Germans from fleeing and stop an economically disastrous migration of workers. It was a symbol of the Cold War, and its fall in 1989 marked the approaching end of the war. United States and UK sources expected the Soviet sector to be sealed off from West Berlin, but were surprised how long they took to do so. They considered the Wall an end to concerns about a GDR/Soviet retaking or capture of the whole of Berlin; the Wall would presumably have been an unnecessary project if such plans were afloat. Thus, they concluded that the possibility of a Soviet military conflict over Berlin had decreased. The East German government claimed that the Wall was an “anti-fascist protective rampart” intended to dissuade aggression from the West. Another official justification was the activities of Western agents in Eastern Europe. The Eastern German government also claimed that West Berliners were buying state-subsidized goods in East Berlin. East Germans and others greeted such statements with skepticism, as most of the time the border was closed for citizens of East Germany traveling to the West but not for residents of West Berlin travelling East. The construction of the Wall caused considerable hardship to families divided by it. Most people believed that the Wall was mainly a means of preventing the citizens of East Germany from entering or fleeing to West Berlin. During the years of the Wall, around 5,000 people successfully defected to West Berlin. The number of people who died trying to cross the Wall or as a result of the Wall’s existence has been disputed. The most vocal claims by Alexandra Hildebrandt, Director of the Checkpoint Charlie Museum and widow of the Museum’s founder, estimated the death toll to be well above 200. Early successful escapes involved people jumping the initial barbed wire or leaping out of apartment windows along the line, but these ended as the Wall was fortified. East German authorities no longer permitted apartments near the Wall to be occupied, and any building near the Wall had its windows boarded and later bricked up. On August 15, 1961, Conrad Schumann was the first East German border guard to escape by jumping the barbed wire to West Berlin. On 22 August 1961, Ida Siekmann was the first casualty at the Berlin Wall: she died after she jumped out of her third floor apartment at 48 Bernauer Strasse. The first person to be shot and killed while trying to cross to West Berlin was Günter Litfin, a 24-year-old tailor. He attempted to swim across the Spree Canal to West Germany on August 24, 1961, the same day that East German police received shoot-to-kill orders to prevent anyone from escaping. East Germans successfully defected by a variety of methods: digging long tunnels under the Wall, waiting for favorable winds and taking a hot air balloon, sliding along aerial wires, flying ultralights and, in one instance, simply driving a sports car at full speed through the basic initial fortifications. When a metal beam was placed at checkpoints to prevent this kind of defection, up to four people (two in the front seats and possibly two in the boot) drove under the bar in a sports car that had been modified to allow the roof and windscreen to come away when it made contact with the beam. They lay flat and kept driving forward. The East Germans then built zig-zagging roads at checkpoints. The Cuban Missile Crisis, when the U.S. Navy set up a blockade to halt Soviet nuclear weapons on their way to Cuba, brought the world closer to nuclear war than ever before. Continuing to seek ways to oust Castro following the failed Bay of Pigs Invasion, Kennedy and his administration experimented with ways of covertly facilitating the overthrow of the Cuban government. In February 1962, Khrushchev learned of the American plans to assassinate Fidel Castro; preparations to install Soviet nuclear missiles in Cuba were undertaken in response. Alarmed, Kennedy considered various reactions, and ultimately responded to the installation of nuclear missiles in Cuba with a naval blockade and presented an ultimatum to the Soviets. Khrushchev backed down from a confrontation, and the Soviet Union removed the missiles in return for an American pledge not to invade Cuba again. The tense few days after the American blockade and before the resolution was reached, later called the Cuban Missile Crisis, brought the world closer to nuclear war than ever before. The aftermath of the crisis led to the first efforts in the nuclear arms race at nuclear disarmament and improving relations. Moscow–Washington hotline: A system that allows direct communication between the leaders of the United States and the USSR, established in 1963 after the Cuban Missile Crisis to prevent another dangerous confrontation. Fidel Castro: A Cuban politician and revolutionary who governed the Republic of Cuba as Prime Minister from 1959 to 1976 and then as President from 1976 to 2008. Politically a Marxist-Leninist and Cuban nationalist, he also served as the First Secretary of the Communist Party of Cuba from 1961 until 2011. Under his administration Cuba became a one-party communist state; industry and business were nationalized and state socialist reforms implemented throughout society. Bay of Pigs Invasion: A failed military invasion of Cuba undertaken by the CIA-sponsored paramilitary group Brigade 2506 on April 17, 1961. The Cuban Missile Crisis was a 13-day (October 16-28, 1962) confrontation between the United States and the Soviet Union concerning American ballistic missile deployment in Italy and Turkey with consequent Soviet ballistic missile deployment in Cuba. Televised worldwide, this event was the closest the Cold War came to escalating into a full-scale nuclear war. In response to the failed Bay of Pigs Invasion of 1961 and the presence of American Jupiter ballistic missiles in Italy and Turkey, Soviet leader Nikita Khrushchev decided to agree to Cuba’s request to place nuclear missiles in Cuba to deter future harassment of Cuba. An agreement was reached during a secret meeting between Khrushchev and Fidel Castro in July 1962 and construction of a number of missile launch facilities started later that summer. The 1962 midterm elections were underway in the U.S. and the White House had denied charges that it was ignoring dangerous Soviet missiles 90 miles from Florida. These missile preparations were confirmed when an Air Force U-2 spy plane produced clear photographic evidence of medium-range (SS-4) and intermediate-range (R-14) ballistic missile facilities. The United States established a military blockade to prevent further missiles from entering Cuba. It announced that they would not permit offensive weapons to be delivered to Cuba and demanded that the weapons already in Cuba be dismantled and returned to the USSR. After a long period of tense negotiations, an agreement was reached between President John F. Kennedy and Khrushchev on October 27. Publicly, the Soviets would dismantle their offensive weapons in Cuba and return them to the Soviet Union, subject to United Nations verification, in exchange for a U.S. public declaration and agreement never to invade Cuba without direct provocation. Secretly, the United States agreed that it would dismantle all U.S.-built Jupiter MRBMs, which were deployed in Turkey and Italy against the Soviet Union unbeknownst to the public. When all offensive missiles and Ilyushin Il-28 light bombers were withdrawn from Cuba, the blockade was formally ended on November 20, 1962. The negotiations between the United States and the Soviet Union pointed out the necessity of a quick, clear, and direct communication line between Washington and Moscow. As a result, the Moscow–Washington hotline was established. A series of agreements sharply reduced U.S.–Soviet tensions during the following years. The United States was concerned about an expansion of Communism, and a Latin American country allying openly with the USSR was regarded as unacceptable given the U.S.-Soviet enmity since the end of World War II. Such an involvement would also directly defy the Monroe Doctrine, a U.S. policy which, while limiting the United States’ involvement in European colonies and European affairs, held that European powers ought not to have involvement with states in the Western Hemisphere. The United States had been embarrassed publicly by the failed Bay of Pigs Invasion in April 1961, launched under President John F. Kennedy by CIA-trained forces of Cuban exiles. Afterward, former President Eisenhower told Kennedy that “the failure of the Bay of Pigs will embolden the Soviets to do something that they would otherwise not do.” The half-hearted invasion left Soviet premier Nikita Khrushchev and his advisers with the impression that Kennedy was indecisive and, as one Soviet adviser wrote, “too young, intellectual, not prepared well for decision making in crisis situations… too intelligent and too weak.” U.S. covert operations continued in 1961 with the unsuccessful Operation Mongoose. In May 1962, Soviet Premier Nikita Khrushchev was persuaded to counter the United States’ growing lead in developing and deploying strategic missiles by placing Soviet intermediate-range nuclear missiles in Cuba, despite the misgivings of the Soviet Ambassador in Havana, Alexandr Ivanovich Alexeyev, who argued that Castro would not accept the deployment of these missiles. Khrushchev faced a strategic situation where the U.S. was perceived to have a “splendid first strike” capability that put the Soviet Union at a huge disadvantage. Khrushchev also wanted to bring West Berlin—the American/British/French-controlled democratic enclave within Communist East Germany—into the Soviet orbit. The East Germans and Soviets considered western control over a portion of Berlin a grave threat to East Germany. For this reason among others, Khrushchev made West Berlin the central battlefield of the Cold War. Khrushchev believed that if the U.S. did nothing over the missile deployments in Cuba, he could muscle the West out of Berlin using said missiles as a deterrent to western counter-measures in Berlin. If the U.S. tried to bargain with the Soviets after becoming aware of the missiles, Khrushchev could demand trading the missiles for West Berlin. Since Berlin was strategically more important than Cuba, the trade would be a win for Khrushchev. Khrushchev was also reacting in part to the nuclear threat of obsolescent Jupiter intermediate-range ballistic missiles that the U.S. installed in Turkey in April 1962. Kennedy met with members of Executive Committee of the National Security Council (EXCOMM) and other top advisers on October 21, considering two remaining options after ruling out diplomacy with the Soviets and full-on invasion: an air strike primarily against the Cuban missile bases or a naval blockade of Cuba. McNamara supported the naval blockade as a strong but limited military action that left the U.S. in control. However, the term “blockade” was problematic. According to international law a blockade is an act of war, but the Kennedy administration did not think that the USSR would be provoked to attack by a mere blockade. Admiral Anderson, Chief of Naval Operations wrote a position paper that helped Kennedy to differentiate between what they termed a “quarantine” of offensive weapons and a blockade of all materials, claiming that a classic blockade was not the original intention. The crisis continued unabated, and on the evening of October 24, the Soviet news agency TASS broadcast a telegram from Khrushchev to President Kennedy in which Khrushchev warned that the United States’s “outright piracy” would lead to war. However, this was followed by a telegram from Khrushchev to Kennedy in which Khrushchev stated, “if you weigh the present situation with a cool head without giving way to passion, you will understand that the Soviet Union cannot afford not to decline the despotic demands of the USA” and that the Soviet Union views the blockade as “an act of aggression” and their ships will be instructed to ignore it. The U.S. requested an emergency meeting of the United Nations Security Council on October 25. U.S. Ambassador to the United Nations Adlai Stevenson confronted Soviet Ambassador Valerian Zorin in an emergency meeting of the Security Council, challenging him to admit the existence of the missiles. The next day at 10 p.m. EST, the U.S. raised the readiness level of SAC forces to DEFCON 2, indicating “next step to nuclear war,” and one step away from “nuclear war imminent.” For the only confirmed time in U.S. history, while B-52 bombers went on continuous airborne alert, B-47 medium bombers were dispersed to various military and civilian airfields and prepared for takeoff, fully equipped with nuclear warheads, on 15 minutes’ notice. At this point, the crisis was ostensibly at a stalemate. The USSR had shown no indication that they would back down and in fact made several comments to the contrary. The U.S. had no reason to believe otherwise and was in the early stages of preparing for an invasion along with a nuclear strike on the Soviet Union in case it responded militarily as expected. I consider my letter to you of October twenty-seventh and your reply of today as firm undertakings on the part of both our governments which should be promptly carried out… The US will make a statement in the framework of the Security Council in reference to Cuba as follows: it will declare that the United States of America will respect the inviolability of Cuban borders, its sovereignty, that it take the pledge not to interfere in internal affairs, not to intrude themselves and not to permit our territory to be used as a bridgehead for the invasion of Cuba, and will restrain those who would plan to carry an aggression against Cuba, either from US territory or from the territory of other countries neighboring to Cuba. Cuban Missile Crisis: A U.S. Navy P-2H Neptune of VP-18 flying over a Soviet cargo ship with crated Il-28s on deck during the Cuban Missile Crisis.